This image has just been posted on the LEGO House Facebook page. It shows a portion of a set that is being revealed tomorrow that will be available to buy at the House from the 17th April. Thanks to legojeroen for the news. Are the other LEGO House sets actually still available (house, tree?) haven’t had a chance yet to travel there but I’d love to pick them up once I’m there. Maybe it's a spiritual successor to #8558-1. The Bahrag seem to me to most resemble dinosaur BIONICLES. So I'm gonna roll with that. Yeah. @Medicus87 - Yes, they were still available a couple of weeks ago. The new Jurassic World spin off T-Rex mech battle thing? Huh, perhaps it's an imitation on a wind-up toy dinosaur. I see a tail and spikes. I think it's a possibility. Either way, it's probably going to be one of those really expensive collectables that no-one wants to open and can sell for a stupidly expensive price! It’s a normally scaled version of the three huge dinosaur models at the lego house—the one made out of technic, the one made out of duplo, and the one made of system. I've been staring at that picture for a couple of minutes now and I have absolutely no idea whatever that possibly can be. At first I thought the thing on the left might be some sort of animal (or dinosaur), but what could that thing on the right then be for it to make sense. It looks like some sort of machine. @LegoSonicBoy I agree. BIONICLES. Bahrag remakes with system. I'm on the hype train. It looks like the dinosaurs at the top of the LEGO House inside. They are built of each LEGO “type”: System, Duplo, Technic. Now when their eggs are hatching, it would be a perfect match to release an exclusive set of the three dinosaurs. Just kidding—Huw and team are great. It's Grimlock! LEGO Transformers Theme coming soon! After a quick Google search, I'll have to agree with @DecR504 - it's almost definitely a mini version of the system, technic, and Duplo dinos. @Your future president, actually, just for a change, no! Just looking at the pic it seems pretty clear that it's some kinda dinosaurs. 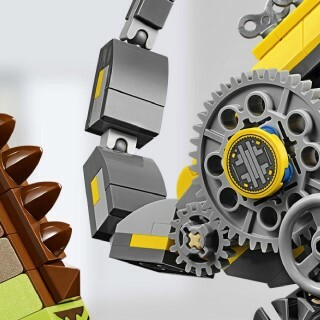 What worries me is that they've used the "wind-up key" piece (which doesn't connect to technic axles) and how the small gear seems to be attached to the axle-peg piece (and therefore doesn't connect to anything else), again showing Lego's total inability to add good technic functions to a "system" (ie. proper bricks) set - ref. all the half-baked "play features" we've seen over the years which would've been significantly improved if they'd hadn't been so shy of including a bit more elaborate technic features in regular sets. Not sure what it is specifically, but if it's being sold exclusively at the LEGO House in Billund, I would put this in the category of "sets I will never own." Yep reading comments and googling dinosaurs in the house. they are miniature versions colors match up with parts and everything! Ok... Huw has revealed this to the world as he was sent it three weeks ago. I was excited for a moment thinking of what cool exclusive house to expect, but was really confused how the photo had anything to do with a new Lego house. ?????? Looks like a robot dino at first glance to me, but @LegoSonicBoy some system Bahrag would be awesome! Oh thats so cool, the dinosaurs from the House!!! Too bad I went there last year and can't afford to go again, they really should do something that allows you to order these exclusives online by entering your ticket-barcode or something. @axeleng: I dunno, as somebody who adores Technic action features I feel like there's been an abundance of good ones in System sets over the past decade or so (last year's 70641 Ninja Nightcrawler comes to mind). For this set, though, I think they're focused more on the dinosaurs as a static display than as a functional model, and the wind-up keys aren't being used as functional elements so much as they are a way to evoke the look and feel of a life-size Technic build in a "microscale" System set. Who cares? Unless LEGO can make these for people that don’t fit into the 1% that can afford to travel to Denmark, it’s pointless. It will be a set that pees off 99.99% of LEGO fans because they can't make it to the house and buy the set. Yes! Perfect timing as I'm going on the first Inside Tour of the year! @Phathead: People live in Denmark too, you know. Maybe try feeling happy for people who can get the set instead of taking the fact that you can't personally? Something. It could be anything. @Sethro3 — or it could be nothing. But as my son says, nothing is something too.